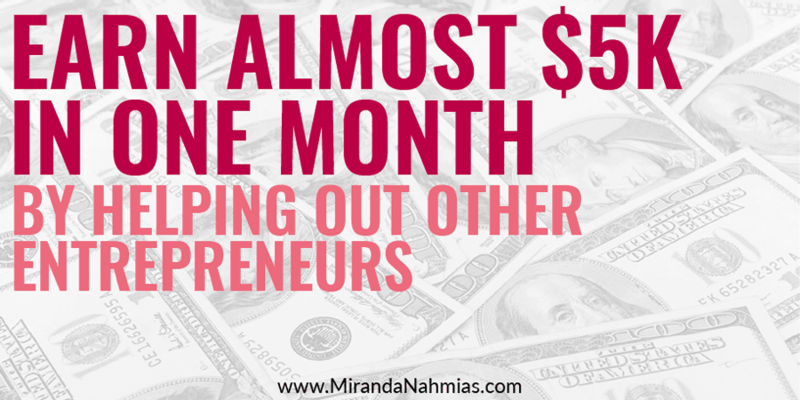 October 2016 Income Report: So Close to $5k - Miranda Nahmias & Co.
Let’s jump right in with this month’s income report! I’m so excited to share with you guys what went on this past month in my business. I’m finally starting to feel like I have a good handle on my business, and I’m super looking forward to watching my business change and grow over the next few months. October started off a little weird. I had an AMAZING month in August, and then September took a huge dip because I was so burnt out and stressed from all the hard work I did in August to achieve such a big profit. An important goal of mine recently has been to be able to figure out how to combine pulling in those high-income months without all the stress and long nights. Once I hit my #1 business goal in August (making more in profit than I did from my full-time job in one month), I was also experiencing a bunch of weirdness associated with my business. With my biggest goal achieved…what was next for me? October was a big soul-searching month. I spent a lot of time thinking about where I want to see my business go in 2017, and coming up with a plan for what my new goals are and how I can go about reaching them. I launched my second course! — This was a little bit of an unexpected turn of events, but I ended up launching my course Four Figure Facebook Formula in October! Seeing as how I wasn’t super prepared for it, I’m proud of how the launch went. I came back to Instagram — After a months-long hiatus, I finally started posting on Instagram again! My Goals For October 2016: Success or Failure? 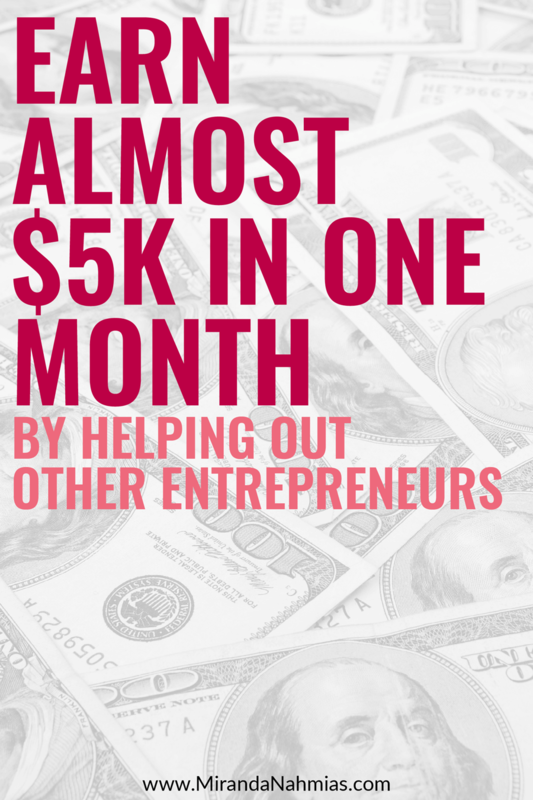 Launch one of my upcoming passive income products — SUCCESS! I mentioned this above…I launched my new course Four Figure Facebook Formula. Complete two webinars — SUCCESS! I did a webinar with my friend Michelle about how to uplevel your blog with video. I also did my first solo webinar all about cold pitching. They both went really well. I’m starting to like doing webinars a lot! Get the problem with my email sequences sorted out — FAILURE. I actually did work on this, but it’s still not 100% sorted out. Keep expenses under $1,000 — FAILURE. Oh my gosh, this is like the month of *so close. * I went $60 over on expenses, unfortunately. My Goals for November 2016 — Let’s Do This! Get 25 people to sign up for The VA Vault. Finish uploading all course content for the Four Figure Facebook Formula. Hire a launch strategist for the FFFF spring relaunch. Earn at least $500 that did not come from my services. October 2016 Income Report: All the Stats & Analytics! October was such an awesome month! And really a landmark in my business. Not only did I launch my amazing new signature course Four Figure Facebook Formula, I also managed to have my best month ever in income and profit. I’m thinking that November will bring in even more course sales, so I’m really excited to see how that will affect my numbers. I also had my best month in terms of amount of blog posts and page views! I don’t really get that many page views at all, compared to other bloggers, and that number seems to creep up very slowly compared to my amount of subscribers and social media followers. I really hope to increase my page views up to around 10,000 views per month by January! After talking to my husband Brent, we’ve both agreed that we want to save up and spend money on two major things in 2017: a business strategist/coach and a huge website redesign. Because we want to be able to invest in those things (plus pay taxes! ), we are really trying to limit the amount of expenses we’re shelling out each month. One thing that I did splurge on in October was getting some branded styled stock photos taken. I got a bunch of them, and they came out amazing! It’s something I’ve been wanting to purchase for months now, so I’m glad that I finally bit the bullet and hired someone. The girl who did mine is amazing and pretty affordable if you want to check her out on Facebook: Styled Stock by Brooke. Other than that big purchase, the rest of my expenses were on point! The largest ones being Wave and Paypal transaction fees, as well as team member payments, which are all obviously mandatory. It’s not very concrete, but my ultimate goal is to increase my amount of passive income and delegation so that I can work fewer overall hours on client work. I love working on my own business and new ventures, but those things are always getting pushed to the side. I really hope to keep working to build my team and delegate more so that my amount of time spent working on client projects is down to something like 10 hours per week. What will also help me to accomplish this is working on building up my passive income. Right now, I have three infoproducts available to purchase, and a bunch of potential income from affiliate sources. During November I will be spending most of my time focusing on launching The VA Vault, and then hope to work on tightening and strengthening my funnels in December and January.